A splendid historic mansion located in one of the world’s most famous natural environments. The Castle of Rossino is an ideal venue to host corporate and institutional events throughout the year near Milan. Thanks to its strategic position, the castle is close to the main cities of Lombardy, but at the same time it is far from the mayhem of the metropolis. A very convenient location, easy to reach from the provinces of Milan, Lecco, Monza Brianza, Como and Bergamo. The basic structure of the Castle of Rossino is a large stone pavilion on three floors and is ideal for organizing seminars and conferences. The two large twin rooms Benaglio and Manzoni, on the upper floors, can be set up with rows of seats and reception and wardrobe areas. On the ground floor, Sala della Rosa is characterized by a beautiful stone floor, and is perfect as an environment for coffee breaks and buffets. In addition to conferences and seminars, the Castle of Rossino can also host team building events for the Milan area. This type of experience is increasingly requested by companies wishing to consolidate a working group and promote its growth. These activities aim to improve communication among the members of a group, increasing harmony and performance. Thanks to its atmosphere full of history and to the natural landscape that surrounds the Castle of Rossino, the castle is an excellent location for team building activities, which can last a few hours or extend over one or more days. In fact, the participants can stay overnight near the Castle. Plenty more are the types of events you can hold at the Castle of Rossino for the areas of Milan and its surroundings. Because of its evocative atmosphere, full of history and undisputed charm, the building is also suitable for dinners and lunches. A truly exclusive and refined place where you can welcome your special customers. You can reserve both the halls inside the castle and its gardens for organizing business lunches or dinners. In the castle’s open-view kitchen, we can organize a personalized catering service with dishes created and prepared on site. An Expert Team with many years of experience will support you and be available to present a wide range of proposals and provide assistance and advice in choosing the most suitable menu for the occasion. The companies wishing to organize a business lunch or dinner will be followed by industry experts at all stages of the planning of the event, including the tables’ mise-en-place, guaranteeing care and quality in every detail. All gardens and lounges are equipped with business points and wireless connection. Projectors, screens, platforms and technical audio and video systems can be installed on request. 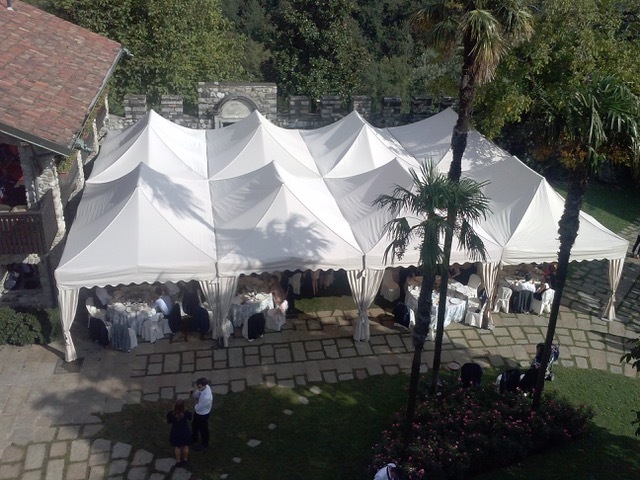 Finally, from March to October the gardens are available as a location for events, thanks to tensile structures and gazebos, or just for refreshments in the open air, so that everybody can admire the splendid view over Lake Como. If you are looking for a location for events near Bergamo or weddings near Monza Brianza or a location for weddings near Canton Ticino, the Castle of Rossino is your perfect choice, thanks to its convenient position in relation to all of these neighbouring places. Request information through the website, we will clear all your doubts, for a fairytale wedding!